Happy Monday! This has been a crazy couple of days for me! I graduated! Hooray class of 2013! I'm officially an SLP! In all my new-grad excitement, I've created a few new activities for you guys! This first one I'm debuting is another Who-Dun-It. It's great for inferencing, and it's a lower-level activity that can be used with your elementary kids! 1) Download the preview file for the chart the kids can fill in. 2) Open the powerpoint and go through the different clues that are provided for each suspect. 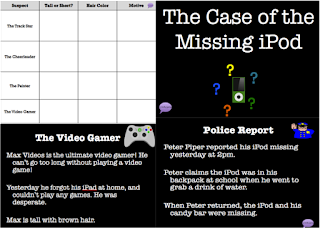 Don't forget to read the police report and the eye witness report! 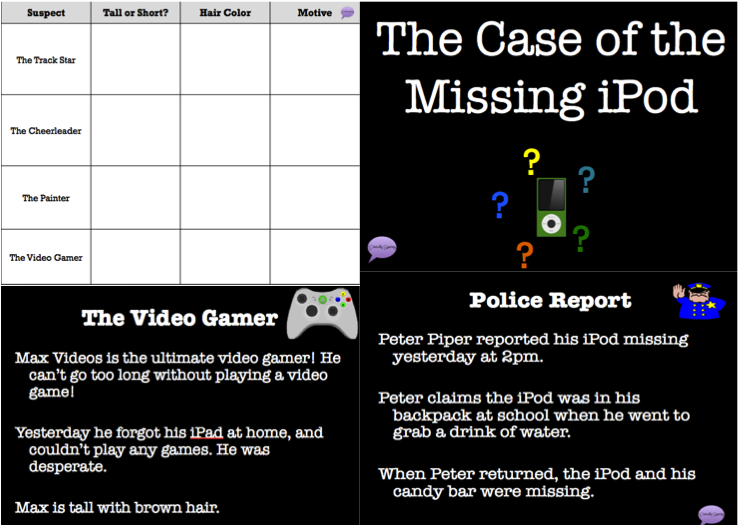 3) When you've reached the last suspect, have students compile a list of who they think it is, why, and their motive. Download this fun activity HERE and be sure to tell me how it goes!